The statement made by the Defense Minister of Armenia D.Tonoyan at the meeting with the Armenian community in New-York on “new war for new territories” instead of “peace for territories” formula is another admission by the high-ranking Armenian official of agressive policy of this country, Azerbaijani Foreign Ministry told AzVision.az. "The statement of the Armenian Defense Minister made immediately after the meeting of the Armenian Prime Minister with the President of Azerbaijan in Vienna and joint statement adopted as a result of the meeting underlining the importance of building up an environment conducive to peace and taking concrete and tangible steps in the negotiation process for a peaceful solution of the conflict is provocative in nature and opposes the efforts of the international community through the OSCE MG Co-Chairs. We bring to the attention of the Armenian side that the Armed Forces of the Republic of Azerbaijan are among the most powerful armies in the world and are able to liberate the occupied territories of Azerbaijan in a short time on the basis of the relevant provisions of international law for self-defense," said the statement. The statement reads that unlike Armenia, Azerbaijan does not make territorial claims against other states and does not have a goal to occupy any territories. 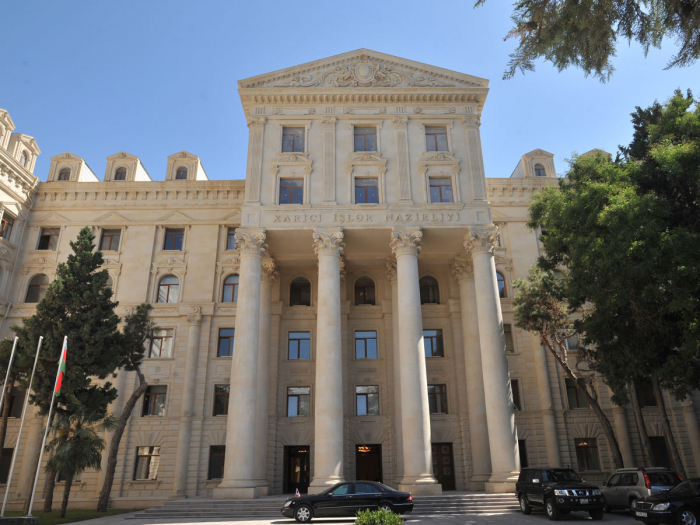 Azerbaijan demands, in accordance with the resolutions of the UN Security Council, the immediate, complete and unconditional withdrawal of the occupying forces of Armenia from the internationally recognized territories of Azerbaijan, said the ministry. "All efforts of Azerbaijan supported by the international community are aimed at achieving this goal. Otherwise, Azerbaijan is ready to liberate its territories from the Armenian occupation by any other means, guided by the relevant norms and principles of international law, as well as the UN Charter, and Armenia is well aware of this. In conclusion, we would like to hear the comment of the top leadership of Armenia in the context of the statement of the defense minister: did the minister make this statement with the consent of the leadership of Armenia or was it ministerial improvisation aimed at casting doubt on the essence of the negotiations and the joint statement adopted on the results?" said the statement.